The week's top seller was kind of a new release, the recent re-release of Snow White and the Seven Dwarfs on Blu-ray again (the new Signature Edition features the same video and audio transfer as the previously released Diamond Edition, but has a different set of supplements). Despite it being a re-release, it still managed to easily outsell the next best new release, The Last Witch Hunter, in second place. As an interesting side note, 'The Last Witch Hunter' will also be available on Ultra HD Blu-ray at the beginning of March. There was another new release in 3rd place, Spielberg's Bridge of Spies. The next new release was in 5th place - Batman: Bad Blood, with the last of the new releases (in the top 20) being Evangelion 3.33: You Can (Not) Redo 9th place. Outside of the top 20, we have Our Brand Is Crisis which managed to get as high as 14th on the combined Blu-ray and DVD chart. With DVD revenue remaining virtually unchanged from the week before, but Blu-ray revenue rising, Blu-rat market share rose as a result, mostly helped by the Blu-ray exclusive re-release of Snow White. BD sales share for a title is the percentage of disc packages sold for this movie that contained the Blu-ray edition of the film (including combos). So a BD sales share of 60% indicates that 60% of disc packages sold for this particular film contained the Blu-ray edition for this film, and so anything over 50% means that the Blu-ray version of the film was more popular than the DVD version. The title that had the best BD sales share this week was actually 'Evangelion 3.33: You Can (Not) Redo', with 83.13%. It was followed by 'Batman: Bad Blood' with 67.18%. 'Bridge of Spies' managed 46.78% and 'The Last Witch Hunter' manage 42.24%. 'Our Brand Is Crisis' managed 23%. The stats for the week ending 7th February 2015 are as follows. Some small adjustments to the data posted last year (based on more recent updates) has been made and is shown below. Blu-ray sales decreased by $0.62m (down 1.7%), while DVD sales decreased by $17.82m (down 21.2%) producing $18.44 million less in combined revenue. Blu-ray's market share increased from 30.42% to 35.29%. A big A-list release this week in the new James Bond movie Spectre, and it helped to raise both Blu-ray and DVD revenue. DVD revenue actually rose a bit more than Blu-ray, which meant Blu-weekly Blu-ray market share dropped slightly compared to last week. It was only one of three new releases in the Blu-ray top 20 this week (which shows once again that it's not quantity, but quality) - Crimson Peak in 5th place and Love the Coopers in 16th were the only other new releases. But it was 'Spectre' that really made the difference, with the highest weekly DVD revenue figures for 2016 being recorded this week. 'Spectre' did quite well on Blu-ray, with a 62.75% BD sales share that topped the BD sales share chart. 'Crimson Peak' also managed to get over the 50% mark, with 51.55%. 'Love the Coopers' didn't do as well as the other two, with only 26%. The stats for the week ending 14th February 2015 are as follows. Some small adjustments to the data posted last year (based on more recent updates) has been made and is shown below. Blu-ray sales increased by $4.3m (up 11.3%), while DVD sales decreased by $11.58m (down 12.7%) producing $7.28 million less in combined revenue. Blu-ray's market share increased from 29.44% to 34.72%. Just like last week, we only have three new releases in the top 20. But unlike last week, none of them were 'Spectre', and so Blu-ray and DVD revenue both dropped compared to last week. The best selling new release this week was Black Mass, but it only sold enough copies to be the second best selling Blu-ray title of the week (behind, you guessed it, 'Spectre'). Steve Jobs was the next best selling new release in 7th place. Outside of the top 10, The 33 was in 14th, while further outside the top 20, we had Criminal Activities which finished 15th on the combined Blu-ray and DVD chart. Of the new releases this week, it was actually 'Steve Jobs' that had the best BD sales share, with 57.75%. Next best was '	Black Mass' with 45.12%. 'The 33' managed 24% while 'Criminal Activities' got 22%. The stats for the week ending 21st February 2015 are as follows. Some small adjustments to the data posted last year (based on more recent updates) has been made and is shown below. We have 2016's first "all red" week, as 'Black Mass' et al. failed to beat this time last year's line-up of 'Game of Thrones: The Complete Fourth Season', 'Dumb and Dumber To' and 'The Interview'. Blu-ray sales decreased by $10.19m (down 25.9%), while DVD sales decreased by $12.81m (down 15.6%) producing $23 million less in combined revenue. Blu-ray's market share decreased from 32.39% to 29.61%. The Good Dinosaur was the best of this week's new release, and the week's top seller on Blu-ray. The release of this latest Pixar animated film helped Blu-ray revenue rise compared to last week's results (DVD revenue was up too, but not as much as Blu-ray, and so weekly Blu-ray market share rose as a result). There were a few other new releases in the top 20 as well. The next best selling was the Oscar Best Picture winning film Spotlight, in 3rd place. Further down in 7th place was the next new release, the 2015 English remake of Secret in Their Eyes. Outside of the top 10, Extraction was in 12th place along with My All-American in 19th place. Diablo finished 14th place on the combined Blu-ray and DVD chart, but failed to get into the Blu-ray top 20. 'The Good Dinosaur' also had the best BD sales share of the week, with 50.13%. It was also on Blu-ray 3D, with a BD3D sales share of 3.83%. 'Spotlight' wasn't too far behind with 48.47%. 'Secret in Their Eyes' got 33%, while 'Extraction', 'My All-American	' and 'Diablo' got 29%, 27% and 19% respectively. The stats for the week ending 28th February 2015 are as follows. Some small adjustments to the data posted last year (based on more recent updates) has been made and is shown below. Following last week's first "all red" week for 2016, we have the second one straight away. But that's totally understandable because this time last year, 'Big Hero 6' was the standout release (and one of the biggest releases in 2016). Blu-ray sales decreased by $21.24m (down 37.7%), while DVD sales decreased by $23.49m (down 24.7%) producing $44.73 million less in combined revenue. Blu-ray's market share decreased from 37.19% to 32.88%. Disc revenue and Blu-ray market share all fell this week, despite no less than six new releases in the top 20. The most popular of these new releases, and this week's top seller overall, was Creed. In third place was the next new release, The Night Before. Room in 7th and Legend in 9th rounded off the new releases in the top 10. Outside of the top 10, Lego DC Comics Super Heroes: Justice League - Cosmic Clash and Barbie: Spy Squad finished 15th and 16th respectively. There were one more notable release outside of the top 20, The Danish Girl, which finished 20th on the combined Blu-ray and DVD chart. So plenty of new releases, but none that you would call A-list, hence the lacklustre set of results. Despite not being near the top of the sales charts, 'Legend' actually had the best BD sales share of all the new releases this week, with 55.05%. The week's actual best seller, 'Creed' did less well in terms of BD sales share, with 43.79%. 'The Night Before' managed 39.82%, just slightly ahead of 'Lego DC Comics Super Heroes: Justice League - Cosmic Clash' with 38.87%. 'Room' wasn't too far behind either, with 38.10%. As for the other new releases, 'The Danish Girl' had 35%, while 'Barbie: Spy Squad' got 20%. None of this week's mentioned new releases were available on Blu-ray 3D. The stats for the week ending 7th March 2015 are as follows. Some small adjustments to the data posted last year (based on more recent updates) has been made and is shown below. Another "all red" week, but again understandable given that box office hit 'The Hunger Games: Mockingjay - Part 1' was this time last year's top seller. Blu-ray sales decreased by $22.39m (down 46.3%), while DVD sales decreased by $31.35m (down 34.3%) producing $53.74 million less in combined revenue. Blu-ray's market share decreased from 34.60% to 30.19%. Both Blu-ray and DVD revenue rose compared to the previous week as the release of The Peanuts Movie helped sales go upwards for the week. It was one of four new releases in the top 20, with the next most popular new release being In the Heart of the Sea in 4th. Down in 10th place was Victor Frankenstein, while Open Season: Scared Silly in 13th place rounded out the new releases in the top 20. 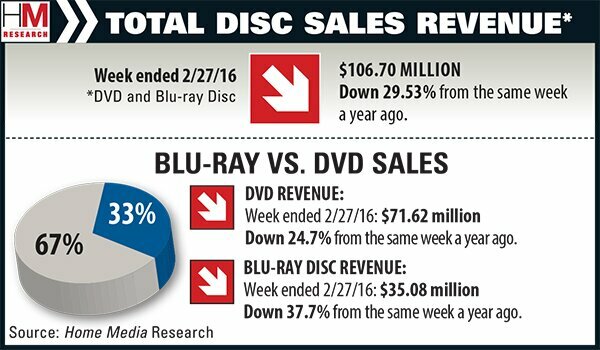 While all disc revenue rose, Blu-ray did a bit better than DVD, and so weekly Blu-ray market share rose too as a result. This week is also a bit special, as we have the first bit of data on Ultra HD Blu-ray disc sales, more details in the 'Blu-ray, Ultra HD Blu-ray Sales Share' section below. 'The Peanuts Movie' was also this week's best release in terms of Blu-ray sales share, with a BD sales share of 55.09%. 'In the Heart of the Sea' managed 38.33%. Both were also available on Blu-ray 3D, with BD3D sales shares of 3.90% and 4.49% respectively. 'Victor Frankenstein' got 31% while 'Open Season: Scared Silly' managed only 14%. As mentioned earlier, we have the first bit of information on Ultra HD Blu-ray releases, with the first four titles available. 'Mad Max: Fury Road' had the highest UHDBD sales share, with 6.19%, followed by 'The Martian' with 2.56% and 'The Last Witch Hunter' with 1.91%. The only new release on the list is 'The Peanuts Movie', but its Ultra HD Blu-ray sales was only 0.27% of total disc sales. The stats for the week ending 14th March 2015 are as follows. Some small adjustments to the data posted last year (based on more recent updates) has been made and is shown below. Blu-ray sales decreased by $7.42m (down 19.3%), while DVD sales decreased by $12.65m (down 15.6%) producing $20.07 million less in combined revenue. Blu-ray's market share decreased from 32.20% to 31.23%. Both Blu-ray and DVD revenue rose again, with Blu-ray revenue's rise most likely related to the release of Game of Thrones: The Complete Fifth Season, while DVD's rise may have something to do with the release of Alvin and the Chipmunks: The Road Chip. There were four more releases in the top 20, starting with Sisters in 5th place. A little bit behind in 6th place was The Big Short. Brooklyn was the next new release in 11th place. In 13th place was Carol. 'Game of Thrones: The Complete Fifth Season' and 'The Big Short' had the best BD sales shares of the week, with 59.74% and 56.47% respectively. 'Sisters' managed 42.48%, which was respectable for a comedy. 'Carol' managed 35.95%, with 'Alvin and the Chipmunks: The Road Chip' getting 34.91%. 'Brooklyn' failed to reach the BD sales top 20 with "only" 31%. None of these new releases were available on Blu-ray 3D or Ultra HD Blu-ray. The stats for the week ending 21st March 2015 are as follows. Some small adjustments to the data posted last year (based on more recent updates) has been made and is shown below. Finally a break from the run of "all red" weeks, thanks to a small rise in Blu-ray revenue. Blu-ray sales increased by $0.96m (up 2.7%), while DVD sales decreased by $0.15m (0.2%) producing $0.81 million more in combined revenue. Blu-ray's market share increased from 31.71% to 32.33%. Stats:Blu-ray's market share decreased from 31.71% to 32.33%. A big new release this week, and another one that wasn't too shabby either. The big release was the final installment in the Hunger Games saga, The Hunger Games: Mockingjay - Part 2, easily this week's top selling title, outselling the second placed one by more than a 4-to-1 margin. The second placed one was the Will Ferrell, Mark Wahlberg comedy Daddy's Home. And with the pre Easter sales bump happening, both DVD and Blu-ray results looked great for the week. The Hunger Games wasn't satisfied with just the top spot, it also managed to find a place in the 9th and 10th places, won by the related The Hunger Games: Complete 4-Film Collection and the Walmart exclusive 'The Hunger Games: Mockingjay - Parts 1 & 2' double movie pack. Monster High: Great Scarrier Reef got onto the combined Blu-ray and DVD chart at number 15, but failed to sell enough copies on Blu-ray to get into the Blu-ray top 20. As a result of the last 'Hunger Games' movie mainly, with some help from 'Daddy's Home', both Blu-ray and DVD revenue rose quite significantly compared to the previous week, and Blu-ray weekly market share rose to a two months high, and weekly Blu-ray revenue surpassed the $50 million mark for the first time in 2016 (weekly DVD revenue was also at its highest in 2016). 'The Hunger Games: Mockingjay - Part 2' managed a BD sales share of 55.25%, with the 4-film collection getting 50.34% and the Walmart exclusive final teo movie pack at 50.25%. 'Daddy's Home' didn't do as well, but did enough for a comedy, with 40.00%. 'Monster High: Great Scarrier Reef' managed 40%. None of these new releases were available on Blu-ray 3D or Ultra HD Blu-ray. Ultra HD Blu-ray titles 'The Martian' and 'The Peanuts Movie' continue to under-perform on the new 4K platform, with UHDBD sales shares of 0.94% and 0.10% respectively. The stats for the week ending 28th March 2015 are as follows. Some small adjustments to the data posted last year (based on more recent updates) has been made and is shown below. A not too common event where DVD revenue is up compared to this time last year, and Blu-ray revenue was down. Blu-ray sales decreased by $2.06m (down 3.8%), while DVD sales increased by $2.22m (up 2.4%) producing $0.16 million more in combined revenue. Blu-ray's market share decreased from 37.44% to 35.98%. 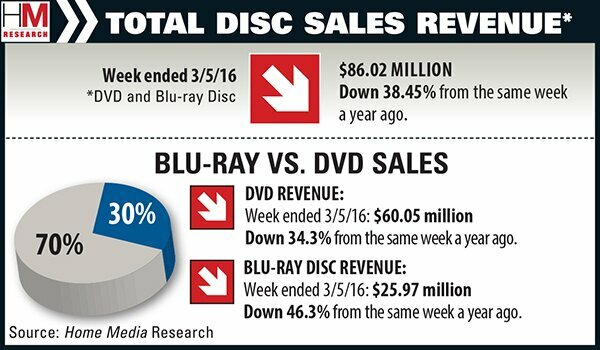 The post Easter lull is upon us again, with Blu-ray and DVD revenue falling back from last week's highs. While studios traditionally avoid this week to bring out new releases, there were still five new releases in the Blu-ray top 20. The best selling of these new releases, and the week's top seller, was The Hateful Eight. The 2015 remake of Point Break was the next best selling new release, in 3rd place. Down in 5th place was the next new release, Concussion. That was it for new releases in the top 10, and the next new release was Forsaken in 16th place, and followed by Exposed in 18th place. But the post Easter lull being what it is, DVD revenue fell to its lowest level since early January, although Blu-ray revenue managed to stay above $30 million for the week. 'The Hateful Eight' did relatively well on Blu-ray, with a BD sales share of 55.06%. The remake of 'Point Break' managed 40.57%, while 'Exposed' was further down the list with 35%. 'Concussion' managed 34%, with 'Forsaken' only getting 19%. Out of the new releases, we have both a 3D release and a UHD release. 'Point Break' was the title available on 3D, with a BD3D sales share of 5.75%. As for the UHD release, it was Will Smith's 'Concussion', but it managed a UHDBD sales share of only 1.84%. To put this into context, only one copy of the UHD edition was sold for every 18 copies of the standard Blu-ray edition. The stats for the week ending 4th April 2015 are as follows. Some small adjustments to the data posted last year (based on more recent updates) has been made and is shown below. It's another "all red" week, but this one was unavoidable as differing times for Easter meant this week's post Easter lull was up against last year's pre Easter bump. A fairer comparison would be to compare this week with the week ending the 11th of April 2015, and both Blu-ray and DVD did better this year than last year, with Blu-ray in particular doing much better. Blu-ray sales decreased by $37.93m (down 38.2%), while DVD sales decreased by $20.7m (down 40.5%) producing $58.63 million less in combined revenue. Blu-ray's market share decreased from 33.96% to 33.10%. What a difference a week makes, but that's what happens when you get a new Star Wars film, and one of the top grossing films of all time, released on Blu-ray. That film was of course Star Wars: Episode VII - The Force Awakens, and it completely dominated the sales charts, beating the second placed (and last week's number one) 'The Hateful Eight' by a ratio of nearly 42 to 1. Both the original and prequel trilogy box sets was also back in the top 10 at 4th and 5th respectively, with the complete trilogy (well, not as complete now) selling as high as 8th. So it's perfectly understandable that Disney and other studios decided to keep the release slate clear this week, to avoid having to compete with one of the biggest Blu-ray releases of all time. Only Lionsgate was so bold as to schedule a (relatively) significant release for this week, but Countdown only managed to get as high as 19th on the combined Blu-ray and DVD sales chart (and nowhere to be found on the Blu-ray top 20). As for how big The Force Awakens was. While it did not break any Blu-ray weekly sales records, but outside of the busy holiday sales period where the revenue records are usually broken, it was one of the best weeks, easily beating the likes of 'Jurassic World' from last year, and not quite beating 'Frozen' from a couple of years back. One record broken was the weekly Blu-ray market share, at 59.28% it's the first and only time that Blu-ray revenue has exceeded DVD revenue in weekly sales - the previous record was "only" 48.62%, set by the aforementioned 'Jurassic World'. There's also another record broken, read on to find out. Here's where that other record was broken. Not counting Blu-ray exclusives and catalog re-releases, The Force Awakens's 82.61% represent the biggest BD sales share for a new release yet, and explains why this week's DVD revenue figures were barely above that of last week's. Nobody wanted to buy the DVD version of the latest Star Wars movie, and this is exactly the kind of movie you'd prefer to see on Blu-ray over standard definition DVD. As for the other new release, 'Countdown' managed only 15%. The stats for the week ending 11th April 2015 are as follows. Some small adjustments to the data posted last year (based on more recent updates) has been made and is shown below. Another unfair comparison, as this week's "Biggest Blu-ray Title Ever" was up against last year's post Easter sales lull. An "all green" week was inevitable. Blu-ray sales increased by $69.52m (up 289.4%), while DVD sales increased by $5.31m (up 9%) producing $74.83 million more in combined revenue. Blu-ray's market share increased from 28.95% to 59.28%. I think, it was the very first time ever, when Blu-ray figures beaten the DVD sales. However, let's see if it was a one time only thing, or it will generate a permanent surplus over DVD sales. I think it will be one time only, maybe will extend for a week or two, but it won't be permanent. The DVD version of The Force Awakens was pretty basic, plus the movie being what it is at the box office, and with the Blu-ray pricing relatively reasonable compared to the bare bones DVD edition, it all helped to drive sales in one direction. Well that didn't last long, following last week's record breaker, things are back to a relative normal, with Blu-ray weekly market share retreating back below the 50% mark. Justice League vs. Teen Titans was the week's top selling new release, but it was only second on the Blu-ray top sellers list, behind Star Wars. There were two more new releases in the top 20, with The Forest being the better seller at 5th, and Standoff not doing as well in 11th. So no record breaking heroics this week, but with DVD sales falling faster than Blu-ray sales, Blu-ray weekly market share was able to remain above 40% for the week. Following The Force Awaken's heroics, another new release this week came close to matching the BD sales share record for new releases, an unlikely candidate actually. 'Standoff' had a BD sales share of 79.81%, which is unusually high for a title that is, to put it kindly, not particularly well known. 'Justice League vs. Teen Titans' managed 58.93%, which is much more in line with your typical release. The stats for the week ending 18th April 2015 are as follows. Some small adjustments to the data posted last year (based on more recent updates) has been made and is shown below. Blu-ray sales increased by $14.28m (up 64.8%), while DVD sales decreased by $1.13m (down 2.1%) producing $13.15 million more in combined revenue. Blu-ray's market share increased from 28.86% to 36.34%.